BARNESVILLE’S Jagger Jefferis works to the plate during Saturday’s championship game of the Shamrock Classic at Memorial Park in western Belmont County. The southpaw struck out 10 and allowed two hits as Barnesville won its third straight Classic, 10-0, in 6 innings over Wheeling Central. BARNESVILLE — Saturday was definitely a good day to play two as Chicago Cubs Hall of Famer Ernie Banks was famous for once saying. Barnesville, after blanking Monroe Central 10-0 in a 6-inning semifinal of the Shamrock Classic baseball tournament, the Shamrocks (11-0) remained unbeaten when they duplicated that fete against Wheeling Central in the championship game under the Memorial Park lights. Jagger Jefferis was nothing short of outstanding on the mound. 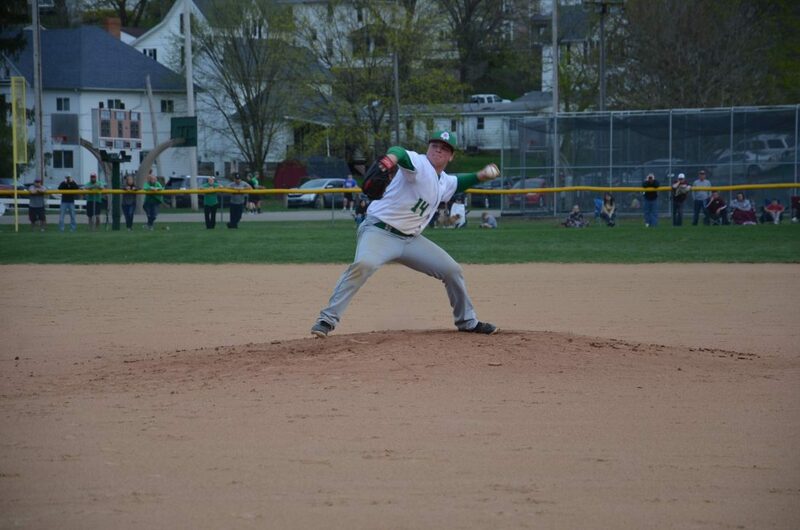 The junior lefty struck out 10 Maroon Knights and allowed just two hits in going the distance. He threw 81 pitches, with 56 going for strikes. The title-tilt victory marked the third consecutive season that Barnesville has won its own tournament. “Our senior class has been big for us. Cade Hannahs has been steady for four years. You can’t ask for anymore from him,” Barnesville head coach D.J. Butler said of his sure-handed shortstop and cat-quick leadoff hitter. “Aron Marovich has been big and Hunter Carpenter has gotten a lot of time lately in the outfield. Dillon Clark got a big hit for us. “Our junior class is really strong and it has a lot of arms … pitchers,” Butler advised. Barnesville has lost Zack Thompson (broken left foot) and Luke Eddy (broken right arm) in the last 10 days. “The kids have done a great job of hitting the ball. We’ve been getting good pitching and we’ve been playing solid defense,” Butler added. Jefferis drove in what proved to be all the runs he would need with a two-run single woth one out in the third. Ayden Hannahs followed with a run-scoring double to make it 3-0. It stayed that way until the fifth when Barnesville took advantage of three Wheeling Central walks, two errors and a hit batsman to tally five times, bumping the count to 8-0. “Our defense was not very good. When you give up five runs on one hit, you’re not going to win the game,” Wheeling Central head coach Bo McConnaughy admitted. “That takes nothing away from Barnesville. The Jeffers kid pitched one heckuva game. He’s a stud. I knew from the third inning on that we weren’t going to hit him. I think we only had two hits and we only got two guys to third all game. Aron Marovich scored on Ayden Hannahs’ infield single and Hannahs streaked home when Alex Meade singled through the left side as the Shamrocks walked off as 10-run mercy rule came into affect. C. Hannahs, Marovich, A. Hannahs and Riley Tubaugh all had two hits. Tubaugh singled in a pair. The teams meet again today at the I-470 J.B. Chambers Youth Sports Complex, weather permitting.